Insect bites can be toxic to horses. In order to treat the sting or bite it is important to try to identify the offending culprit. A closer look at the type of insect bites and the clinical reactions are important to the well-being of your horse. "The stings of insects, spiders and scorpions cause varying degrees of painful swelling at the site of the sting. In cases of a large number of stings, a horse may go into shock as the result of absorbed toxins, and, rarely, anaphylactic shock can occur if the horse has been exposed to the same toxins in the past. If you see the symptoms of your horse going into shock, call your veterinarian immediately." Horse First Aid for Bites and Stings The reactions manifest themselves in many different ways: heavy breathing, immobility, reluctance to move forward, swelling, heat in an affected area, elevated heart rate, elevated respiratory rate, temperature, chills, infection and shock to mention a few. Black and Brown Widow Spider (Latrodectes) - The black widow spider is responsible for one of the most serious insect bite reactions in horses. These spiders are venomous and can cause serious problems for your horse. The Black Widow bite can kill tissue and cause severe pain and itching. Often times the horse's hair falls out around the bite. You may notice an oozing which may be clear, yellow or green in color. There may also be a bad odor from infection. An antivenom (aka antivenin or antivenene) is available for treatment of black widow spider bites. Make sure that your horse is up-to-date on the tetnus shot. Black Widow Spiders are not particularly aggressive, however, they will bite if they feel threatened. The female is the gender with the toxic venom which is a neurotoxin. Neurotoxins can cause muscle rigidity, difficulty breathing and paralysis. The Black Widow Spider can be identified by her black body with a red hour glass making on her belly. Brown Recluse Spider (Loxosceles) aka Missouri Brown Spiders- There is a violin-shaped patch on the broad, almost heart-shaped cephalothorax (the head, as opposed to the abdomen) of this spider. The overall color is usually a grayish-yellow-brown. The oblong abdomen covered with gray hairs. The legs are darker than the body and are long and slim. Females are larger then males. The webs are small, irregular, and untidy. These spiders are usually seen walking or running around, not in a web. The Brown Recluse Spider can cause a severe localized necrotizing reaction. It is not a generalized systemic illness. The bites cause a painful reaction which is warm to the touch. Withing 3 to 7 days a deep, debilitating wound open up. There is significant tissue loss and usually secondary infection. Medications are given to reduce the inflammatory response as well as antibiotics to fight the infection. The damage takes a while to heal and often the horse is eft with permanent tissue loss. These spiders are not aggressive but will bite when threatened just like the Black Widow Spiders. Bites increase with the onset of cold weather. The spiders become more active in an attempt to find warmer living spaces with the on slot of the cold. An antibiotic used by many vets to treat brown recluse spider bites is Dapsone. Make sure that your horse is up-to-date on the tetanus shot. 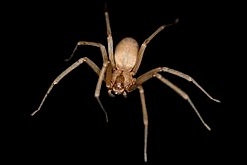 Unlike the black widow, the brown recluse and its relatives cause a severe localized necrotizing reaction, but not a generalized systemic illness. Brown recluse bite sites are initially warm and painful. Over the subsequent three to seven days they can develop into deep, debilitating open wounds with significant tissue loss and secondary infection. Treatment is aimed at controlling infection, reducing the inflammatory response, and maintaining a healthy wound environment. The healing process can be prolonged, and permanent tissue loss can occur. Tarantulas - Spider venom causes tissue to die quickly and severe localized necrotizing reactions. The bite sites are initially warm and painful. Over the subsequent three to seven days they can abscesses can develop into deep, debilitating open wounds with significant tissue loss and secondary infection. Treatment is aimed at controlling infection, reducing the inflammatory response, and maintaining a healthy wound environment. The healing process can be prolonged, and permanent tissue loss can occur. If you know that your horse has been bitten by a tarantula immediate and aggressive vet treatment can limit tissue damage and infection. For example, the vet might use an antivenin along with antibiotics and medications to help itch and swelling. Hymenoptera is the fancy name, or order, for honey bees, yellow jackets, yellow hornets, wasps and bald faced hornets. It is estimated, however, that there are over 300,000 species of Hymenoptera in the world. Approximately 120,000 have been identified by scientists. The continent does not matter-humenoptera is the order. To the equestrian these are of particular importance because of the outdoor nature of the sport. Not only is the horse impacted by these stinging insects, but so is the rider. It is important to be able to identify the insects, know their habits, know the perils, and know how to treat horse and human, if stung. Honey bees - The honey bee is easily identifiable. They collect pollen and bring it back to the hive to make honey. They tend to be less aggressive unless their nest is threatened, or unless accidentally stepped on with bare feet. They like the clover. Once stung, a honey bee will die. It deposits its stinger in its victim. There is the fear that killer bees, which are extremely aggressive, will mix with our docile United States honey bee. Authorities are trying to stop this migration. Bumble bees - The bumble bee is larger than the honey bee. It is usually ¾" to 1 ½" most often black and yellow in color, hairy, collects and carries pollen on its hind legs. They are found collecting pollen in flowers, around homes, and other out buildings such as sheds, garages, and barns. Bumble bees are docile and unaggressive when foraging flowers, but vicious when their nests are threatened or disturbed. Paper Wasps - Paper wasps are about 1 inch long. They have slender bodies with long legs and a slender waist which differentiates them from honey bees and bumble bees. The wasp's color varies from golden brown to darker browns. Sometimes they have patches of red or yellow on them. Paper wasps prefer to live near trees-orchards or vineyards-and hang their paper like nests in protected areas. Each nest hangs like an open umbrella from a stalk. Most of these paper wasps are considered unaggressive. Wasps can, however, sting repeatedly because they keep their stingers unlike honey bees. They continue to live to sting another day! Yellow jackets- Yellow jackets are by far the most aggressive and most troubling of this group to horse-back-riders and horses. These insects often nest in the ground and defend their nests with great gusto when disturbed. They can also sting repeatedly and frequently do. Unlike honey bees, they keep their stingers. Yellow jackets often use abandoned rodent holes, rotten tree stumps, fence post bases, river banks, in houses, and in trees. Yellow jackets tend to be medium sized and have yellow bands around a black background. They have a very short, narrow waist. As the season progresses and colony numbers increase food becomes scarcer. In the fall they become scavengers and frequent picnic areas, barbecues, garbage cans, etc. As the weather cools down in the fall months the yellow jackets become sluggish. The fall temperatures tend to fluctuate in degrees. This makes the yellow jackets very unpredictable. They may sting you even unprovoked. The horse-back-rider has to be particularly mindful when riding trails. As the horse's hooves hit the ground the vibrations can be felt in the ground nests. These vibrations get the yellow jackets stirred up. Usually one or two horses will pass without incident and then the riders and horses behind may suddenly be surrounded by stinging yellow jackets. They will follow you up to two miles, unrelentlessly. The yellow jackets prefer darker colors so black horses and bay horses are more preferable quarry. Expect your horse to turn into a bucking bronco when being stung and hold on for the ride of your life! My husband and I have been attacked several times by yellow jackets and I am highly allergic. In fact, I carry an epi-pen and antihistamine always. I also wear sunglasses to protect my eyes as yellow jackets gravitate to dark holes like your eyes, nostrils, mouth and ears. I wear light colors and stay away from patterns and bight colors. We also carry a medical kit with cortisone cream, medicated swabs, and alcohol swabs, in our saddlebags. Bald-faced Hornets - (Bald face hornets, white faced hornets, yellow hornets, aerial yellow jackets) While researching these insects, I discovered that they are not really hornets at all, but are wasps, or at least it would seem so. These insects live in wooded areas, and make large nests from chewed wood pulp. It is turned into a paper-like material. At times, their nests can get as large as a football. The nests are often seen hanging from trees and buildings. These insects are only aggressive if threatened but will vigorously defend their nests if bothered. Horse Symptoms from bee stings or the above mixed vespids include swollen red bump or bumps and/or knots, heat, swelling itching and rubbing and flu-like symptoms. When a horse is having an allergic reaction to the sting or stings you may see swelling around your horses eyelids, lips, tongue and/or neck, increased temperature, shivering, off of feed and water, lethargy, and a red scab at the center of the sting bumps. Call your vet immediately as a severe reaction to the venom can cause anaphylatic shock and death. Contact your vet for guidance. Itch and inflammation can be relieved with a soothing topical skin product. Many also reduce infection risk. If swelling is present a cold pack can be used to reduce the swelling and pain. Try to minimize your horse rubbing or biting the bite to reduce the chance of lesions. Horse sheets can keep off pesky insects and also help if your horse rubs. Keep your horse well groomed, make sure the horse's healthy diet is maintained along with plenty of clean water, keep the stalls and environment clean to reduce bacteria fungus and parasites, monitor the wounded area several times a day. Watch for any changes that cause concern and report them immediately to your vet. 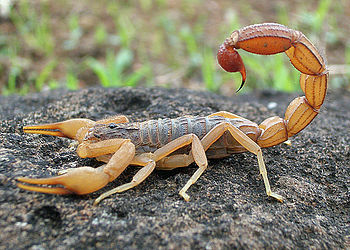 Scorpion - Scorpion stings cause local reaction and sometimes illness, and tend to heal very slowly. There is often heat, swelling and itching at the sting site. Clean the site and use a baking soda paste at the site. Then apply ice packs which can help reduce pain and swelling. After icing apply a calamine lotion or Cortaid to help relieve any itching or skin discomfort. Repeated stings can cause a horse to go into shock as the result of absorbed toxins. Rarely anaphylactic shock can occur from past toxin exposure. In that case call you vet immediately! 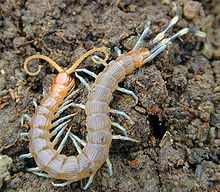 Centipede - Centipede stings cause local reaction and sometimes illness, and tend to heal very slowly. There is often heat, swelling and itching at the sting site. Clean the site and use a baking soda paste at the site. Then apply ice packs which can help reduce pain and swelling. After icing apply a calamine lotion or Cortaid to help relieve any itching or skin discomfort. Repeated stings can cause a horse to go into shock as the result of absorbed toxins. Rarely anaphylactic shock can occur from past toxin exposure. In that case call you vet immediately! Other insects such as biting midges, no see ums, fire ants ("...According to the USDA, two species of imported fire ants (IFA) were introduced into the United States from South America at the port of Mobile, Alabama. The black imported fire ant, Solenopsis richteri Forel, arrived sometime around 1918, and the red imported fire ant, Solenopsis invicta Buren, in the late 1930s. Both species probably came to the port in soil used as ballast in cargo ships. Today, imported fire ants infest more than 343 million acres in Alabama, Arkansas, California, Florida, Georgia, Louisiana, Mississippi, New Mexico, North Carolina, Oklahoma, South Carolina, Tennessee, Texas, Virginia and Puerto Rico. Imported fire ants are a major public nuisance because of their ferocious sting and aggressive behavior, and they also damage several agricultural commodities." Fire Ants), mosquitoes, horse flies cause horses untold angst--especially in the warmer months of the year. There are many animals--mammals, reptiles, amphibians, etc., that bite horses; however, that is another article!